When natural teeth are lost, it can lead to negative consequences for your oral health, your self-confidence, and your overall quality of life. Here in San Antonio, Dr. Joseph Noble wants to help you regain your complete, strong smile right away, and no treatment option is more effective or more long-lasting than dental implants. Contact our practice today to schedule your first appointment, or if you have any questions or concerns for our team members. We’re here to help! Unlike traditional tooth replacement plans that only repair the visible portions of teeth, implant supported restorations repair the lost tooth root and crown, delivering a closer-to-natural end result. Fully self-supporting, your implant supported crown, bridge, or denture will not need to rely on other teeth or oral structures for support. This ensures you maintain the optimal level of oral health after dental implant tooth replacement. Once in place, your implant supported restoration can last two decades or longer without the need for repair or replacement. In fact, implant supported restorations have a 90 to 95% success rate after 20 years. Not only do implant supported restorations look and feel more natural, they also ensure healthy function, especially for advanced denture tooth replacement prosthetics. Traditional dentures only replace about 20% of healthy chewing function, limiting your diet. Implant retained dentures restore 70% or more chewing ability, ensuring you can consume a nutritious and varied diet. Why are dental implants the best option for replacing my teeth? Your tooth is composed of two equally important components. First, there’s the white crown that shows when you smile. However, the second piece is much more neglected: the root underneath the gum tissue. While the tooth root goes unseen, its presence is a very important stimulus for your jawbone. Without tooth roots in place, the bone begins to gradually resorb, which can lead to additional tooth loss. So why is this important? Dental implants are the only reconstructive treatment option available today that rebuilds both the crown and root of your tooth, preserving both your oral health and the aesthetic quality of your smile. Of course, Dr. Noble understands that the budget and time commitment associated with dental implants aren’t right for every single patient in need. That’s why he’ll be sure to review every option with you in full, helping you select the right choice for your personal circumstances. Implant-retained dental crowns are ideal for restoring single implants. The tooth-colored addition will blend right in while allowing nearby healthy teeth to stay intact. If you’re missing several teeth in a row, an implant supported fixed bridge may be recommended. Implant bridges are supported by two implant posts, one at each end. For multiple consecutive and nonconsecutive teeth, an implant supported partial denture will be used. These partials are supported by two to four implant posts in most cases. 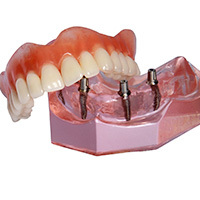 Implant-retained dentures are a solution for restoring a full row of teeth at once. They’re very similar to their traditional counterparts, but the ability to attach in place over four to six implant posts adds much-needed strength and stability. Dr. Noble can either design a fixed (permanent) or removable denture prosthetic. During your treatment planning appointment, we’ll walk you through the costs associated with each stage of treatment. We will process and file dental insurance claims to make the most of any available benefits, and our knowledgeable team members will work with you to access affordable financing options whenever possible. Dental implant treatment is one of the more complex treatments available at our practice. It’s highly customizable, carries many steps and takes a large amount of planning to complete. 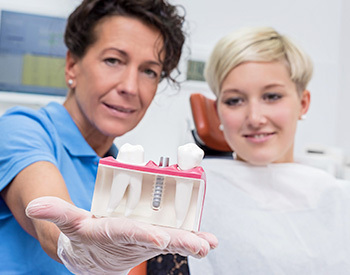 When people first learn about dental implants, they tend to have many questions. We hope that by having a dedicated Frequently Asked Questions page on dental implants in San Antonio, you’ll feel more equipped to discuss them during your consultation. You can also call our office and ask questions that way as well, however we believe an in-person visit will give you more time to get your questions answered. When planned and placed by a dental professional, dental implants are completely safe. We work with trusted oral surgeons to place implants outside of our office, which should provide additional reassurance for your safety. On average, they carry a success rate as high a 98 percent. While it is rare, dental implants can fail if you use tobacco products or have poor oral hygiene. The crown portion of your implant cannot develop cavities like natural teeth, however the gum tissue underneath can develop peri-implantitis, an infection of the gum tissue surrounding the implant. Thankfully, this condition is largely preventable with regular oral hygiene. Our office is in-network with most PPO dental insurance providers, which you can learn more about here. While dental insurance does not typically offer coverage for dental implants, there are certain aspects of your treatment it may cover. The best way to find out for sure is to contact your provider directly. Another common way patients pay for dental implants is through third-party financing programs like CareCredit, which our practice offers. This program cuts your overall cost for treatment into more manageable chunks, often with very low to zero interest attached! Unlike other tooth replacement options, dental implants are designed to last for an incredibly long time. In many cases, dental implants can last for the rest of your life. However, they tend to last for a minimum of 25 years. This is a far cry from dentures, which typically require replacement every several years, or bridges, which only carry a 10- to 15-year lifespan. As long as you practice daily oral hygiene and avoid tobacco products, there’s no reason why they shouldn’t last several decades. It depends. The more complex your treatment is, the longer the planning, healing and restoration phases of your treatment will be. After an implant is placed, it usually takes between three and six months for it to integrate with your existing bone tissue. Once the abutment is placed, the gum tissue requires a few weeks of healing before a final restoration can be placed on top. Overall, you should dedicate at least four to six months for dental implant treatment.